Just in time for holiday feasting, pumpkin spice lattes and New Year’s resolutions: Toni Yancey’s approach to fitness, Instant Recess, was the focus of Jane Brody’s recent New York Times article on physical activity and health. As Yancey notes, everyone wants to be healthier and fitter (I know, come every January 1, I am optimistically penciling these goals into my list of resolutions), but it’s often easier said than done. 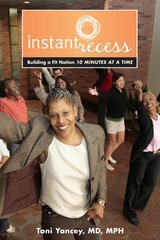 Check out the article to read about how people are incorporating instant recesses into their work routines and school schedules and how it’s benefiting waistlines, bottom lines, and education. Instant Recess: New Podcast with Toni Yancey Waistlines and Bottom Lines Why You Should(n’t) Get Screened for Cancer What if There Were Nutrition Labels For Drugs?